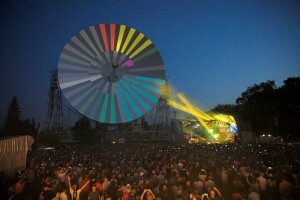 dbn once again supplied stage and architectural lighting plus LED screen to the latest ‘Live at Jodrell Bank’ shows, which featured two nights of performance headlined by the Australian Pink Floyd and New Order at the fabulous Jodrell Bank Observatory site, in the shadow of the charismatic Lovell Telescope. A fabulously sunny weekend welcomed around 6000 music fans per day to the first of two ‘Live’ weekender events staged by Ear To The Ground. Nick Buckley, dbn’s project manager comments: "It was great to be back working on this really special site. The atmosphere was fantastic and it’s an event with a real difference of which we are very proud to be a part." The stage was a 16 metre wide Serious Stages’ Orbit, three bays deep, into which dbn installed three lighting trusses – front, mid and back – all fitted to the curvature of the roof to make the most of the height. A fourth truss was utilised to fly the 8 metre wide by 4.5 metre high LED screen, made up from their new 12.5 mm Eastar surface. 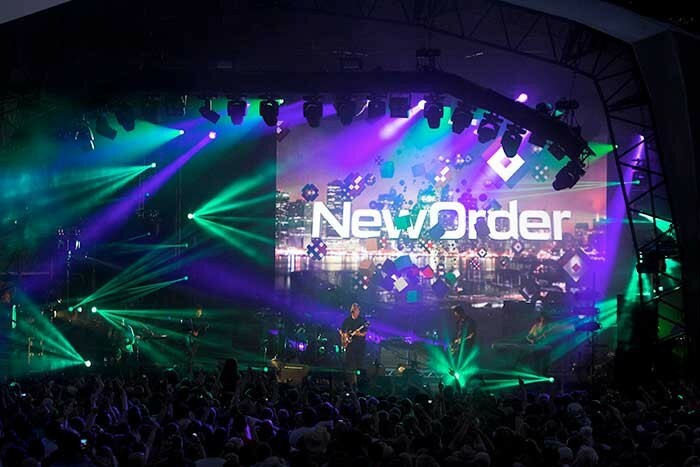 The lighting specification was based on the needs of the two headline acts, both of whom brought their own LDs - James Scott, operating for regular LD Phil White - for Australian Pink Floyd, and Andy Liddle who lights New Order. The moving lights were exclusively Clay Paky – 14 Alpha Spot QWO 800s, 12 Alpha Beam 700s, 14 Alpha Beam 700s and 18 Sharpys, all of which were in the air. dbn also supplied a specials package for the Australian Pink Floyd, comprising 16 Alpha Spot HPE 300s, which were arranged around one of their 5 metre diameter trussing circles positioned upstage. The LED screen was masked into a circle to allow the band’s video content to work in the middle of the circle. Other lights included Atomic strobes, 2-lite and 4-lite blinders and ARRI 2ks, which were used for a general stage wash. dbn supplied an Avolites Pearl Expert as the ‘house’ control desk and which was looked after by Edwin Croft. Andy Liddle brought in his own Avo Tiger Touch and James Scott had his own grandMA. The amazing 76 metre wide Lovell Telescope dish – the world’s third largest steerable telescope – was illuminated by 12 Studio Due 2.5k City Color floods and two Space Flowers supplied by dbn. It was also projected onto by Pod Bluman of Pod Bluman Associates, who like dbn has been involved since the first Jodrell Bank Transmissions in 2011.
dbn’s crew of Ed Marriot, Ed Woodbridge, Phil Sheard, Paul Crompton, James Mather and Edwin Croft got in on the Friday before the Saturday show, so time was tight, but everything went very smoothly. 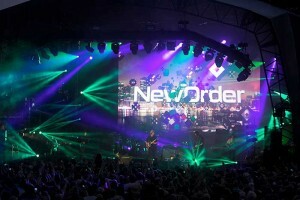 PA was supplied by Audile and lasers for New Order by ER Productions. Nick Walton – whose father was a scientist - has been visiting Jodrell Bank since he was a child so the site has a special resonance for him. He sums up: "This is the third event we’ve been involved with at Jodrell and all have been very special events. It’s always fun working with the production team involved with this show and it seems to bring out the more inventive side of any of the travelling lighting designers who use the rig we provide. dbn will be looking forward to the shows later in the summer at Jodrell."